This recital of Scarlatti keyboard sonatas is charming and full of spark. 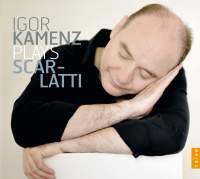 Igor Kamenz approaches Scarlatti with just the right kind of articulation: crisp, slightly detached, and with the slightest bite. He is particularly adept at bringing a sense of drive to toccata-like passages, employing imitative phrasing, echo effects, and slight surges of tempo. In short, he generally treats the Steinway on which this disc was recorded like a period instrument, and he achieves about as close to a period sound as one can reasonably expect from a modern piano. Particular highlights include the deceptively simple Sonata in A, K 322. Kamenz’s precision of phrasing is very effective in this sonata’s two-part texture. Moreover, he varies his approach when repeating the first half, taking slightly broader rubatos and more emphatic accents. The Sonata in G, K 146, is equally subtle. Kamenz makes an elegant contrast in texture between the wispy arpeggios and the steady two-part passages that alternate throughout the piece. His articulation is simultaneously brilliant and light. In the Sonata in D, K 96, Kamenz assigns specific tone colors to the various registers of the piano; one gets the sense of an instrument that operates by registration. His broadening of the third iteration of the opening motif is a particularly nice touch; Horowitz, Cziffra, Casadesus, and many others race through all three. Kamenz’s repeated notes ricochet with pleasing brilliance in the Spanish-inflected Sonata in D Minor, K 141, where he employs heavy bass accents to highlight Scarlatti’s piquant dissonances. Kamenz is generally less successful in the more contemplative sonatas, except for the Sonata in B Minor, K 87. In this sonata, he employs syncopated two-note phrasing and tastefully expressive rubatos. His tempo is considerably slower than Horowitz’s and steadier than Pogorelich’s, making for a somber, meditative presentation. But the Sonata in A Minor, K 109, is hampered by slow, measured trills and a general homogeneity of tone, and the Sonata in B Minor, K 197, employs an anachronistically modern wealth of crescendos and decrescendos and offers no variation to the repetition of the first half. And if I am to nitpick, Kamenz’s pedal is occasionally and unidiomatically obvious, as in the wide-ranging descending arpeggio in the Sonata in D, K 119, and in the unison 16th-note passages in the Sonata in A, K 101. And I find the lengthy accelerando that closes each half of the Sonata in E, K 135, to be a very strange and ineffective choice; it makes the piece sound like it is running away from itself. But the merits of Kamenz’s playing far outweigh the defects. The sound of the recording is generally bright and clear, though the bass occasionally overshadows the treble. This is problematic primarily when Kamenz plays a lengthy treble note quietly, as happens frequently in the Sonata in E, K 381. There is also a good deal of scraping noises that may be breath sounds, particularly obvious in slow, quiet passages. My final remarks do not pertain to the performance itself, which is well worth hearing. But the cover photograph is so peculiar I cannot refrain from commenting on it: Kamenz is portrayed with closed eyes, resting his head on his folded arms, as if asleep. What a strange choice for a recording of largely exciting, rousing music! Likewise, the liner notes portray Kamenz as a pianist whose career had failed to thrive and was recently rejuvenated “by an almost incredible combination of circumstances” after many “reverses and hardships.” But Kamenz has released a steady stream of recordings over the past decade or so, and he has captured first prize in 18 international piano competitions. All in all, he seems to have a rather successful career. And so he should.